UPDATE III, Oct. 14: Please see below for new photos of my latest pseudoscope with the front surface mirrors, also the pyramid info and the dimension drawing have been altered. UPDATE IV, Oct. 15: FS mirrors. UPDATE V, Oct. 20: Framework cube, finish and countersink, see the end of this post. I've never seen the M-X3 in person but I recommend buying one just because they look so great, but if you don't want to spend that much this post will show how to make a pseudoscope for less than $10, and also how to construct better versions for a little more. You will also need a drill and a screwdriver. All supplies except for the screws were purchased from a Hobby Lobby craft store. 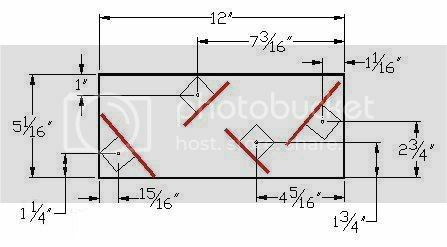 The diagram below shows the dimensions for the screw holes. I've made a couple of changes on the above drawing, the 7.5625" dimension to 7-3/16", moving the top two mirrors a little closer, and on the lower left .9375" to 1-1/4". This site is still a work in progress, I'll be refining these instructions as I test the various pseudoscopes. fraction of an inch here or there shouldn't matter too much. I didn't glue the cubes to the base because it's necessary to rotate the mirrors to align them depending on the distance to the subject matter. If you use different size cubes you will have to work out new dimensions for the holes. It's very important that the wood base is flat, take a close look when buying this piece. Before gluing the mirrors to the cubes, be sure that the bottom and the face where the mirror will be attached are at exactly 90 degrees. To check this use a right triangle, or place two of the cubes on a flat surface and push them together until two of the sides meet, if you do this several times using different orientations of the cubes, you will notice that all sides will not meet perfectly flush. Some will have small gaps at the top or bottom and these are the faces that you want to avoid using. When I find two faces that meet just right, I put a small pencil mark on top of the cube near the side to be glued. Also before attaching the mirrors, drill a hole in the bottom of the cubes. If the mirrors aren't glued to the cubes at the proper angle, when you view an object with the scope you will see a double image, with one of them slightly above the other. 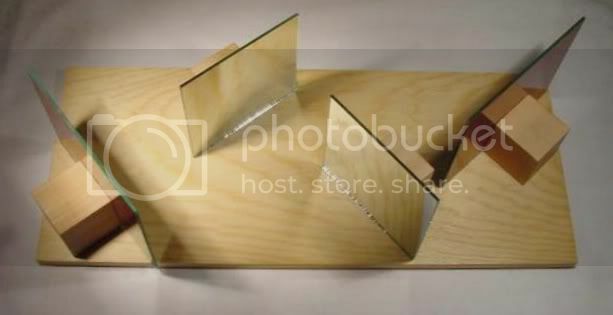 If this happens, use a right triangle to test each of the mirrors, when you find one with a bad angle you could either start over with another mirror and cube or place some thin cardboard or paper shims under the cube to get it to 90 degrees. I don't know what the best kind of glue for this is, but I happened to have some Goop on hand and it has worked well so far. Using just a thin layer of glue, I did two at the same time and pushed them together at the mirror surfaces for a few moments to keep them at the right angle. I would definitely call and get estimates from different glass shops, I've found that prices can vary widely. I purchased some 3"x6"x1/4" mirrors from a surplus store and cut one in half to get two small ones. I like the 6" long mirrors better than the 4" because there is a wider field of view, and with the shorter ones you can see around the side of the 4" mirrors which can be a little distracting. Also, a larger piece of wood about 7"x16" is necessary when using the longer mirrors. 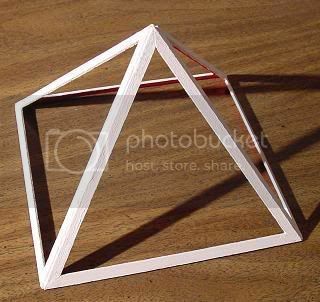 In the M-X3 article, they mention a hypersphere that when viewed through the scope looks inside out and spins in the opposite direction, I discovered that a balsa wood frame-work pyramid works just as well. This illusion can easily be seen with the $10 pseudoscope. 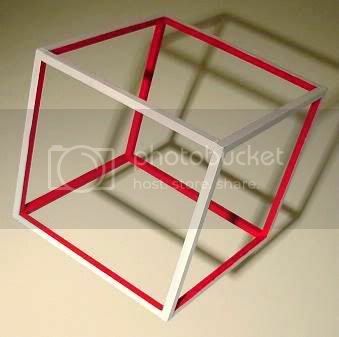 You could also make one of these out of paper or cardboard. 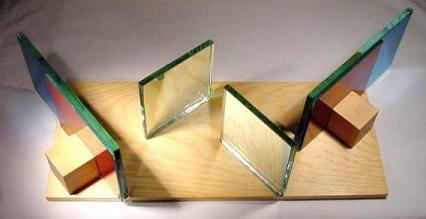 All segments are 6" long, the 1/4" wide pieces were used on the base only. Make each of the four sides first, the corners will look better if you cut the ends of the pieces on an angle so they meet at a point. I taped the four sides together, glued them, removed the tape and then added a little more glue. When spun slowly and seen through the scope it appears that the outside of it is now red and the direction of spin is opposite of what it really is, I was surprised when this actually worked. If you close one eye the pyramid will revert back to it's normal appearance. This illusion is best seen with strong lighting. Don't forget to clean the mirrors before using the scope, fingerprints and smudges will greatly diminish the illusions. Other great things to look at with this device are trees and other plants, it's hard to explain but they appear disjointed and seem very unreal. 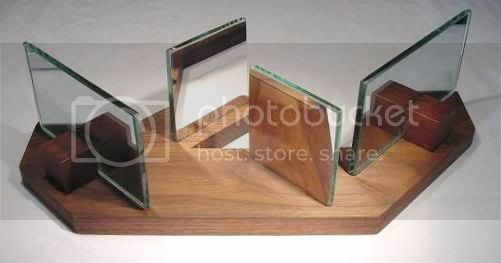 The best option for making a pseudoscope is probably using front surface mirrors, in which the reflective surface is on top of the glass, not behind it like in most mirrors. These don't have a slight double image that can be seen in regular ones. I haven't tried using them yet, but I have some on order, I'm guessing that the expensive pseudoscope uses this type. Item OL8011, they are less expensive than the estimate that I got from the glass shop, but they only have about 100 in stock. UPDATE: The front surface mirrors work very well and don't have the slight imperfections that the inexpensive ones have, but all optical illusions that I've seen with them also work with the ten dollar pseudoscope. I do like the larger size mirrors since they have a wider field of view and require less adjustments. As I mentioned in the prism post, globes and other spheres look concave when viewed with the scope, though sometimes it might not be apparent at your first look. It helps if there is printing or a pattern on the sphere and that the subject is equally lit on both sides. The ten dollar scope will look much better if you apply a coat of natural wood finish to the base and cubes. Also you might want to countersink the holes on the bottom of the base so the screws won't scratch table surfaces. If you have any observations concerning pseudoscopes or find any interesting objects to view, please post them in the comments section. A pseudoscope is an optical instrument made with two prisms. 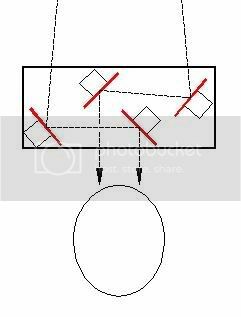 As seen in the drawing, the mirrors reverse the image in each eye causing some items viewed through it to look quite unusual: convex objects become concave, things pointing towards you may look like they are pointing away and vice versa. This site isn't about actually constructing a pseudoscope, but how to replicate some of the effects by holding two prisms up to your eyes. A small terrestrial globe appears as a concave hemisphere; on turning it round on its axis, it was curious to see different portions of the spherical map appear and disappear in a manner that nothing in external nature can imitate. 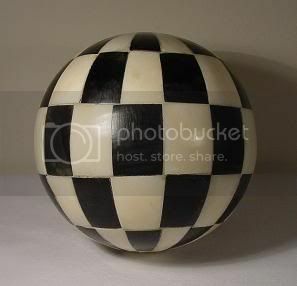 I have a checkered ball that I spun and then looked at through the prisms, when it almost stopped but was still spinning, instead of appearing to spin counter clockwise as it actually was, it switched to looking concave with the spin now being clockwise. For me this illusion is fleeting, jumping back and forth a couple of times between normal and concave, the actual illusion lasting just a second or less before it changes back. This ball also appears concave while standing still, but it must be well lit otherwise the shadows cause the illusion not to work. Two objects at different distances, being simultaneously regarded, the most remote will appear the nearest and the nearest the most remote. 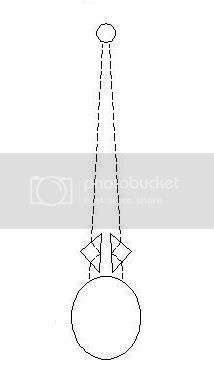 This works for some items under certain conditions, when the objects are not far apart and when viewed from an angle. You should be able to see the illusions mentioned above with a couple of five dollar prisms from the local hobby store, but glass prisms will work much better. 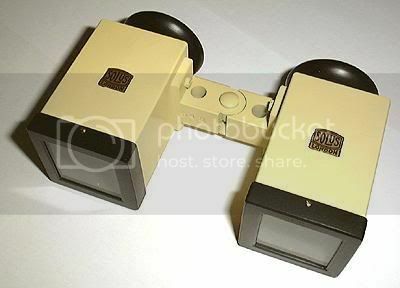 Some of the plastic ones are not very clear, the illusions won't be seen if one of the eyes receives a blurry image, so I recommend closely scrutinizing the optics for best results. These appearances are not always immediately perceived; and some much more readily present themselves than others. This is definitely true, for some of these experiments you may have to try different lighting or re-arrange the objects to get them to work. Also some of the illusions do not appear instantly, but after a few seconds you may begin to see them. Some of these effects are subtle, so I would caution not to over-expect, although several of the ones that I've seen have worked great. 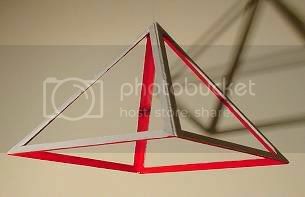 Be sure to use right angle prisms, the equilateral type are not suitable for a pseudoscope.